Defiance is a science-fiction-themed persistent world MMO third-person shooter from Trion Worlds. Defiance takes place on a terraformed Earthseveral decades into the future. It is a tie-in to the Syfy show of the same name. The game was released on April 2nd 2013 for Microsoft Windows,PlayStation 3 and Xbox 360. It was also released on Steam. Much like in Rift, Defiance has “dynamic events” called Arkfalls. These arkfalls are massive chunks of alien ships, which contain valuable technology, that crash down from space, attracting a handful of friendlies and enemies, as well as on occasion attracting masses of alien creatures and dozens of ark hunters. Unlike other MMO’s Defiance does not have classes but rather players can choose from an “origin”. Origins do not limit what abilities, weapons or outfits the players can choose from. Players are said to be able to have a great deal of control over their physical appearance including hair, clothing and tattoos. Players can choose to be either a Human or an Irathient (a humanoid alien species). Players have access to a wide variety of weapons from hand guns to assault rifles and grenade launchers to shotguns. They are also able to modify weapons with new sights, grips and upgraded magazines and barrels. The Ark Hunters are injected with an EGO (Environmental Guardian Online), a symbiotic, neuro-muscular bionetic implant developed by Von Bach Industries, which helps players navigate the Bay Area and gives them access to unique abilities. Trion introduced a new rewards system called “Arkfall Codes”. Players use these 6-digit Arkfall Codes to unlock special bonuses and customization for their characters such as extra inventory slots, titles, and perks. These codes are hidden in various media such as official blogs and videos. 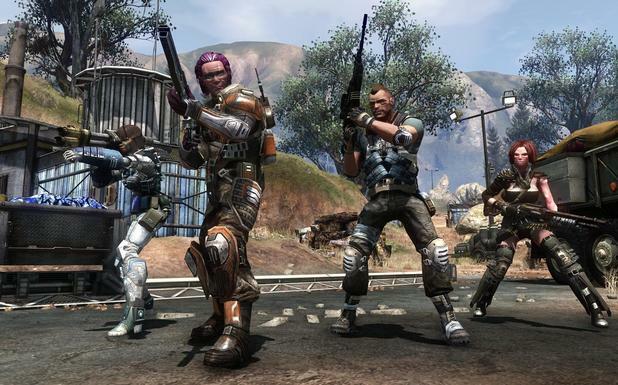 The Xbox 360 version of Defiance has been plagued with technical difficulties since its launch. After putting the disk into the Xbox 360 and installing it (you need to install the 5 GB game onto your hard drive before you can start) and nearly 30 minutes solid of patches and updates, the game promptly crashed. This was actually due to a server update that Trion warned gamers about via an in-game notification system, but it remained down for quite awhile. This has been a theme, and these frequent updates can last hours. Defiance requires you to be online, so when the servers are down there is literally nothing you can do in the game. You can’t even mess with the options. Trion has been good about giving as much notice as possible, but it’s cold comfort for people locked in combat with a giant enemy for up half an hour to see that their session is going to end, possibly right after they win but before the game can register it and credit them (this happened to two of my friends). Random boots are also a common occurrence, and they can happen at anytime. The game continued to tell me my objective was to wipe out the enemy, but it also had three icons signifying three weapons caches I was meant to sabotage. There was even a little icon at the top of the screen, signifying three targets. I dutifully followed the targets and found… nothing. Just… nothing. There was nothing to sabotage or interact with. There were no enemies to kill or objectives to complete. After several minutes, I decided to restart the mission, but with no better luck. I restarted my console, and still nothing. In a game where the majority of mission objectives are completed by shooting people a bunch and holding the X button to interact, this was an obvious flaw. I skipped the mission and moved on to another and I will retry it later. So as for the review, we will hold off through the weekend and hope for the best. It isn’t fair to judge a game on what we hope will be a very temporary problem, plus the issues have slowed any progression. Check back next week and we’ll update this page, hopefully with a legitimate review. Dead Space 3 came out today and that means it’s time to announce some Dead Space 3 DLC! And what’s it all about? About ten bucks! Ha! No, but seriously, Dead Space 3: Awakened will list for $9.99 on the PlayStation 3 and PC, or 800 Microsoft points on the Xbox 360. 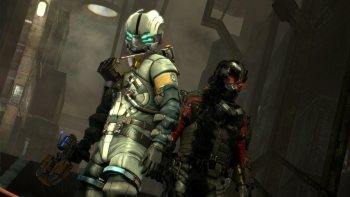 As for where the DLC will take you or what you’ll do in the guise of intrepid hero Isaac Clark, I have no idea, nor do I have any idea why EA seems to think that the best way to handle gamer upset over the presence of microtransactional DLC in Dead Space 3 is to throw more DLC at them on launch day. It’s not as though you have to buy it, but appearance is everything and I can’t help thinking that this comes off as just a wee bit tone-deaf.